Members of the Royal Danish Ballet Come to Jacob’s Pillow, as it celebrates its 86th anniversary. Art, time, and money can squirm and slip around one another in unexpected ways. This year’s Gala at Jacob’s Pillow in the Berkshires made some people open their pockets on the spot and made others wish they could. The mood was jovial, and the weather responded with sunshine (perhaps the gods were penitent about the rain that made last year’s 85th anniversary a damp, slightly muddy one). You could mosey around the premises, taking in the sensational array of historic dance movie posters in Blake’s Barn and drinking in essence of June and whatever else you craved while inspecting the new Perles Family Studio. In various spots, you might also have come upon an arresting duet by members of the Edinburgh-based Janis Claxton Dance. I only watched two variants, but they raised interesting thoughts. Of the four dancers (Joanne Pirrie, Albert Garcia, Amy Hollinshead, and Valerio Di Giovanni), a man and a woman might pair up on a lawn, and later, in another spot, the two men would take it on. The duet itself keeps the partners close together and is full of the intense glances and shifting rhythms that suggest a relationship being tested. The power dynamic between the male-female one I saw seemed more full of small equivocations than the one performed by the two men, although both were equally demanding. 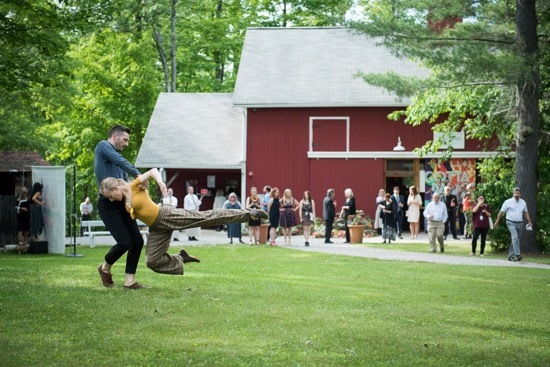 This year, Jacob’s Pillow director Pamela Tatge and her staff and board made a wise decision in relation to time and attention span. No auctioneer trying to elicit bids while the guests (most of whom were already supporters) ate the fine meal served in the enormous tent, where silent-auction items were laid out amid the dining tables. Instead, in the middle of the preceding performance in the Ted Shawn Theater, Coulter Rule began by auctioning off, from the stage, three of the most alluring and pricey items, gradually winding down to call for smaller and smaller donations, while a large group of Jacob’s Pillow students wearing red t-shirts saying “Face the Future” raised a brigade of arms to point out audience members ready to contribute. In terms of time, that strategy got a lot done pretty fast. By that time, we’d seen the twenty-two students in the Pillow’s Ballet Program Scarlet Circles (to music mostly drawn from Bach concertos), which Annabelle Lopez Ochoa had created for them in only four days (the audience gasped when Tatge announced that), and the piece turned out to be a seamless and very fine one—bringing dancers on and offstage in various combinations that gave each one moments in the limelight. We had applauded a tribute to the Ballet Program’s director Anna-Marie Holmes and her music director, Ramona Pansegrau and a tribute to the gala’s honorary chair, Carmen de Lavallade, who looked beautiful and spoke wonderfully, after Amanda Smith, with beguiling vivacity, performed Come Sunday, a piece that de Lavallade’s late husband Geoffrey Holder had made for his wife in 1955. We had applauded choreographer Faye Driscoll as she accepted the annual Jacob’s Pillow Dance Award, which will doubtless lighten her financial burden. All that was left between the auction and dinner was a “preview selection” from Ephrat Asherie’s Odeon, which was to premiere there June 27. Asherie and her colleagues— Manon Bai, Valerie “Ms. Vee” Ho, Linda Madueme, and Matthew “Megawatt” West)— showed how creative you can get working from a tap base. Not just feet making magic with the floor, but arms gesturing as people feint with each other. These people also flip through the air and dance while grounded. Were we getting hungry? Sure. But hadn’t we just been fed in other ways? Yes. Jacob’s Pillow’s 86th summer season began the following week with performances by members of the Royal Danish Ballet (seven principal dancers, two soloists, and two from the corps de ballet). In a program designed by the company’s artistic director, Nikolaj Hübbe, the passage of time, art, and memories slipped around one another in complex ways. For one thing, consider the hundred-year-plus span of the ballets shown: excerpts from works by August Bournonville (1805-1879) that preserve the Romantic Ballet style he learned at the Paris Opera and developed in Copenhagen; a pas de deux from Giselle (1841); the two major pas de deux from Swan Lake (1895), and a pas de deux by Harald Lander, who headed the RDB from 1932 through 1951. The company’s history in the United States began when Ted Shawn brought a group of RDB dancers to Jacob’s Pillow in 1955 (for which he was knighted by the king of Denmark two years later), and in due time the whole company performed in the U.S. Inevitably, my own history plays a role. Like many dance critics and historians, I traveled to Copenhagen for three celebrations of Bournonville’s ballets in 1979, 1992, and 2005. 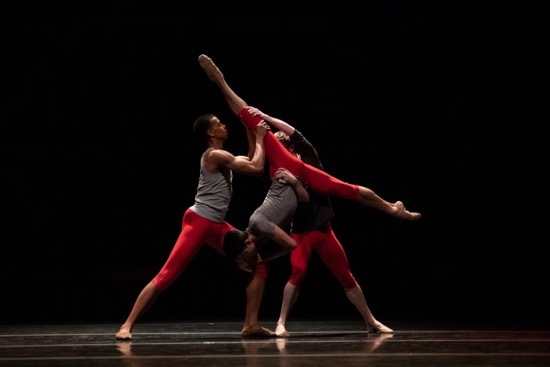 The Jacob’s Pillow program opened and closed the same way as the RDB performance at Manhattan’s Joyce Theater in 2015. The evening began with the final celebratory Pas de Sept from Bournonville’s A Folk Tale (1854) and ended with everyone onstage for Act III of Napoli. The two ballets share themes. Happiness restored. Hero safe. The woman he loves brought back from an alien magical kingdom—A Folk Tale’s Hilda from the trolls’ cave and Napoli’s Teresina from a kingdom under the sea. And what do Bournonville’s people do when they’re happy, and a wedding is finally taking place? They dance. (They don’t dance unhappiness—no despairing developpés; the drama develops in other ways). The dancers in A Folk Tale excerpt don’t wear their usual costumes; instead, the women are garbed identically in full-skirted dresses in the same muted red as the men’s attire. People in this supposed village square become appreciative onlookers when their friends are dancing to Niels Gade’s festive score; the three men (Jonathan Chmelensky, Jón Axel Fransson, and Meirambec Nazargozhayev) clap hands as they leap by their partners (Kizzy Matiakis, Ida Praetorius, Emma Riis-Kofoed, and Amy Watson). In Bournonville’s day, pointe shoes weren’t the hardened objects they later became; a dancer could briefly alight on tiptoe and amaze her audience. That may be why the women dancers charm us with buoyant steps that cause their feet to knit the air and make the floor look more resilient than it is. The men are no less nimble, and both they and the women launch their leaps and let them fly. Often their arms are curved and joined overhead in that en couronne shape that frames their faces, and they tend to hold them low and curved when they jump, which makes you focus on their beating feet. One of Bournonville’s most beguiling steps is a leap in which the performer opens his/her arms as if this were a generous offering to all the watchers. For the sake of modesty, female dancers contemporary with Bournonville didn’t lift their legs very high (although these dancers do). Partners often dance companionably side by side, and no acrobatic lifts occur. The Pas de Six and Tarantella from Napoli not only celebrate a wedding; they reflect Bournonville’s love of 19th-century Naples, which he explored while temporarily banished from the company and the country by the king (a long story). The dancers (all those mentioned plus Holly Jean Dorger, Andreas Kaas, J’aime Crandall, and Marcin Kupiñski) wear ballet’s idea of fisher folks’ Sunday- best attire and try to make up for the missing set and the crowd of extras who usually watch from a bridge. The mood is exuberant (although at the Pillow, there didn’t seem to be enough tambourines in the tarantella), and the variations express that in various ways. Crandall performed the solo whose steps, along with the music by Edvard Helstead and H.S. Pauli, periodically arrest her on one toe for a suspended breath of a moment. Praetorius played the maiden gifted at speedy jumping. Pairs danced together. Trios celebrated. If you’d ever seen Napoli in its entirety, you would have known instantly that Watson and Chmelensky represented Teresina and her beloved fisherman Gennaro. And when you rescue your girlfriend from the king of the sea and his minions by venturing into a tidal cave with a crucifix, you’d better be given a splendid party by your friends. 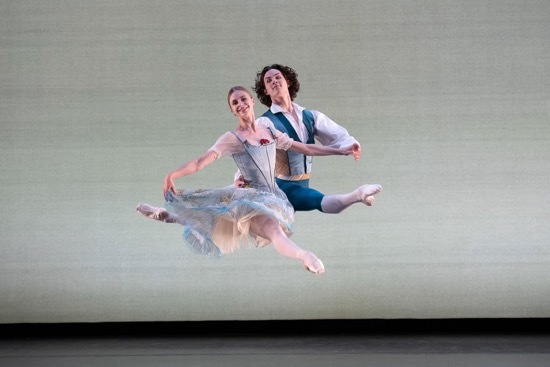 The pas de deux from the first act of Bournonville’s The Kermesse in Bruges displays a similar joyous mood. Praetorious and Kaas performed the duet beautifully. They focus, of course, on us as spectators plus the invisible ones on stage, but mostly on each other. They are sharing some lovely, energetic dancing as a way of discovering love. Again no villagers watching, no mother to grant her daughter permission to dance. But the dance itself is a charming conversation: “please dance for me!” “Of course.” And each shows the other his or her favorite airborne steps and nimble beats. Praetorius watches her own busy feet at one point, as if to assure herself that they were doing their job. La Sylphide (1836) is one of the few extant Bournonville ballets that ends in tragedy, but he didn’t create the scenario. He borrowed it from a ballet he’d seen in Paris—the one that Filippo Taglioni had choreographed for his daughter, Marie, four years previously. Herman Severin Løvenskiold provided new music. This is the pas de deux designed to show how impossible love can be between the Scotsman James and the sylph who has distracted him into the woods and away from the girl he was about to marry. The sweet, supernatural beauty in the long white tutu is constantly flitting away and evading her suitor’s embrace. (Absent the set and the background material, how can spectators know for sure that she is offering him wild strawberries to eat?) Bournonville was no Taglioni; he had a moral message: don’t get carried away by dreams, accept the comforts of a bourgeois family life. Hübbe, one of the finest James of his generation, staged the duet for Watson and Kupinski, and they performed it sensitively—he with ardor, she with innocent wiliness. I think I understand why Hübbe decided to present five pas de deux. He wanted us to understand that these dancers could ace the better-known classics, as well as their own unique heritage. And he wished to give as many of the company members as possible a chance to be scrutinized closely, even though that meant that the first part of the program lasted for over an hour. Harold Lander created his Dvorák pas de deux for television in 1966, setting it to some of the Czech composer’s Slavonic Dances. The music changes in temperament to suit the usual pas de deux format of duets and solos, which means that it’s often triumphant, underscoring the virtuosity that Riis-Kofoed and Fransson displayed; she sitting on his shoulder or carried, arched backward, over his head; his leaps; her pirouettes and leg-thrust-skyward moments. But it’s also courtly and affectionate, with the two of them taking pleasure in each other’s dancing. Hübbe had an interesting idea: to present the two legendary duets from Swan Lake back to back, as if to compare compositions that contain some of the same elements (and I’m not referring just to the Tchaikovsky score). Kaas begins the “White Swan” duet by racing, distraught around the stage. Where am I? Where is she? Matiakis is forlorn—as well she might be as the princess Odette imprisoned in the body of a swan—but also unusually expansive in her grief. Often a dancer portraying the “Black Swan” shows us just what a gorgeous, malicious temptress she is (a characterization that, unfortunately, makes Prince Siegfried look not only bewitched, but a bit dense). I assume that it was Hübbe’s choice to have Darger as Odile seem quite nice—that is, doing a better Odette impersonation; it’s easy to see why Chmelensky as Siegfried is taken in by her. He performs his feats of elevation with fine confidence, and she whips off those aimed-for thirty-two fouettés with beautiful clarity, starting out by alternating single and double turns. The first long part of the RDB’s two-part program finished with yet another duet: the second-act one from Giselle (1841), in which Albrecht, come to lay flowers on the grave of the woman he has betrayed, is greeted by the nymph she has turned into—one commanded to dance him to death. The dancers were Crandall and Nazargozhayev. She looked properly ethereal in her slow, suspended steps. His elevation was terrific, but he seemed too staid. Yet the drama of the tragic, noble situation didn’t come across and quicken our hearts. I, of course, can’t speak for those in the audience who loved seeing these well known pas de deux, even out of context and performed without bravura flourishes. But, although I enjoyed the close-up looks at the excellent dancers, I chafed at what seemed to be historic beads strung together a line to remind us of the Royal Danish Ballet’s history. The program notes were lengthy and excellent, but they couldn’t fully evoke the spirit of the ballets from which the duets were clipped or lead us into the forests and palaces where they died for love. Thank you Deborah from the heart for this beautiful, thoughtful, knowledgeable review, and for posting the clip of Alban Lendorf and Ida Praetorius dancing the Kermesse in Bruges pas, which has given me a joyous start to my day at a time when few begin that way.